TeamKHomes Five-Star Marketing Sells Homes! When you're looking for a partner to help you negotiate the complexities of selling a home, you've come to the right place. 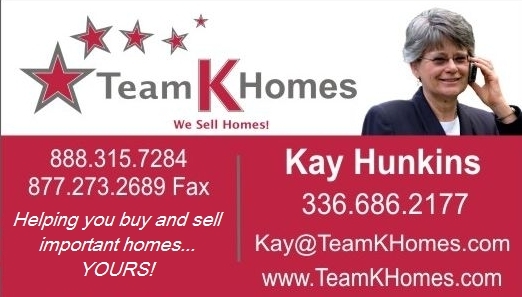 Kay Hunkins' extensive experience selling homes in the Triad area of NC since 1988 is your best partner. Her thorough knowledge of the market, thoughtful dedication and strong communication will help ensure the successful and profitable sale of your home in Burlington, Mebane, Elon, Greensboro, or any surrounding communities in Alamance County and Guilford County, NC. Your home sale has a better chance with TeamKHomes. Kay has lived and worked in this area her entire life, and is a certified appraiser, consultant, investor and rehabber as well as experienced broker. Her expertise is at your service 24/7 throughout your selling process. 2. Internet Advertising - Since the lion's share of home buyers starts their search on the internet, top placement on search engines is essential. You'll gain access to placement on Google, Bing, Realtor.com and other websites. This will maximize your exposure and bring a large number of potential buyers to view information about your home. Searches start on the internet, and actually sells with the help of local Realtor. Kay Hunkins cooperates personally with over 300 local Realtors to get your home sold. 3. Email Campaigns - It's important to "work the network." We can work together to identify the right people to target your home - and get in touch with them by email to drive excitement and interest. 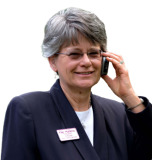 Kay Hunkins maintains a database of hundreds of local people who are notified personally about your home for sale. She calls them her "outside" salespeople. Local people talking to friends and family can help your home sell.